Home Costs > How Much Do Manufactured Homes Cost? A manufactured home — commonly referred to as a mobile home or trailer — is usually made of light materials that can be assembled easier compared to building a full-sized house. These manufactured homes are assembled in a factory and are usually delivered on site. The price of a manufactured home can vary depending on the size of the house as well as the material used to make it. How much are manufactured home prices? The price for manufactured homes mostly vary due to the size, the features, the layout and other factors. Like a house, it’s so hard to give an exact estimate because each manufactured home can be so unique. For an average size manufactured house, the cost can be anywhere between $45,000 and $80,000+. By the time you factor the utility hookups, buying the land, doing the necessary site work to prep for your home, the landscaping, creating a driveway, paying for permits, taxes and fees, the price can be very close to $150 to $225 per square foot. If you don’t factor in these additions, the costs can be within the $30 to $50 per square foot range. Small to large 600 to 1,150 square foot single-wide homes can cost anywhere from $25,000 to $78,000, while double to triple wide 1,250 to 1,900 square foot homes can cost $48,000 to more than $95,000. These tend to be more durable since they are made of a mid-grade construction. Larger manufactured 2,000 to 2,500 square foot homes made of higher grade materials can cost between $86,000 to $125,000. Daily Yonder said the average sales price of a new manufactured home is 64,000 when compared to $269,000 for a newly constructed home. Modular Home Owners said by the time he factored everything in, he ended up paying $211,638. Regardless of where the home is made, it will abide by all local building codes on the construction site. All home will be made in a factory-like setting and will be covered and transported to its new location. These homes are constructed to meet the Federal Manufactured Home Construction and Safety Standard Act of June 15, 1976. These homes can come in a variety of sizes and floor plans, just like a traditional home floor plan. This can include spacious living rooms, multiple bedrooms or a cozy loft. Most of these homes will be within the 900 to 2,500 square foot range. Features available commonly include custom cabinets, walk-in closets, whirlpool tubs, fireplaces and more. A reputable dealer will often have software you can play around with to see what it will cost and what can be added to your home. These homes usually come in single or two-second units and can be as wide as eight to 40 feet. These homes can either be placed on a foundation or basement. Depending on the size of the home, it can take anywhere from 30 to 90 days to build the module and a few days to assemble it to the foundation. 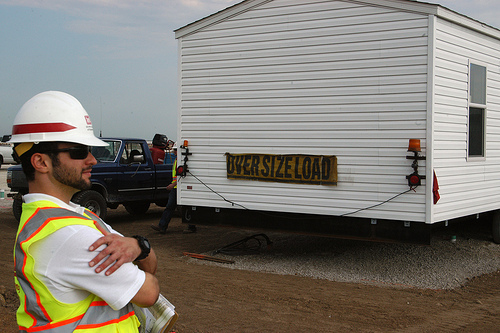 Inspections and miscellaneous site work can be an additional 30 to 90 days, depending on the size of the home. Most of these homes will be sold through a retail sales center; however, some may be sold through the manufacturer as well. Depending on the state, some require you purchase through the developer or a real estate agent/attorney if it’s previously owned. A warranty will come with just about any home and this will cover the workmanship, factory-installed plumbing, heating and electrical systems as well the appliances if installed. It won’t cover accidents, improvement maintenance, owner negligence or normal wear and tear. Most modular home companies will give you a “base” price. Like a car, this can change as you customize your home. Experts recommend you should plan on spending at least $20,000 to more than $30,000 to upgrade your home. This can include upgrading the flooring, expanding the garage or upgrading the kitchen appliances. The prices won’t include the land it needs to be installed on. Like housing, it’s hard to say what land would cost because there are so many factors. In the past, we wrote about how much an acre of land would cost if you would like to learn more about how much you should budget. Prepping the land will be necessary to create an area for the foundation. This can include leveling the land, clearing trees and/or removing any necessary debris to create a solid foundation area. Prepping can cost $5,000 to more than $10,000, depending on the complexity of the land. Taxes, zoning permits, and other fees will be required depending on city ordinances. This will all depend on your geographical region. By the time everything is said and done, many owners ended up paying $7,000 to more than $11,000 in taxes, permits and miscellaneous fees. Additional utility hookups, such as running water and running a gas line to your home. if available, will be an additional price to consider. Depending on how close you are to the street, this can be an additional $2,000 to $3,500. If no water is available, a well will have to be drilled. The same can be said about a gas line; if gas isn’t available, a propane tank will need to be installed. For sewage, a septic tank may be necessary for those without sewer hookups. Landscaping needs to be considered once the home is finished. A driveway, regardless of which option you choose, will need to be considered. Furniture, window treatments and appliances are extra costs to consider since most homes are built with a blank slate. Other options such as a basement, garage, septic system and propane tank will incur additional expenses as well since most of these options won’t be included. Transportation fees may apply depending on how far the company has to travel. Manufactured homes will be very similar to a mobile home since they are usually built in a factory and will be transported to the area where it will be setup. These homes will then be installed either on a foundation or a basement and will sometimes have tie downs in place of a permanent foundation. Modular homes, on the other hand, will also be built in factories and will be transported to be installed on site. After that, the similarities will soon fade as modular homes will have to abide by all local building codes, whereas a manufactured home only has to abide by the HUD code. Modular homes will be treated the same by banks as a home being built-on-site and are easily financed, while a manufactured home can be harder to finance since banks don’t see it as a traditional home and will consider it in their own financing category, leading to much higher interest rates. Also, because of this, a modular home will closely follow market trends like site-built homes. All modular homes must be structurally approved by local inspectors, while manufactured homes are inspected but won’t have to be structurally approved. A modular home can be of any size and are highly customizable, but manufactured homes will be built in sections and are rarely more than one story, creating a “boxy” look. Modular homes are known to be sturdier, while a manufactured home won’t have a conventional foundation, sitting on a steel chassis that’s never removed. The home will be built in a factory controlled setting and all materials will be away from the outside elements. With a traditional home, the material will be left outside while the home is being worked on, sometimes leading to moisture damage or construction delays. Building costs will be much cheaper than an on-site built home. Expect to save at least 20 to 40 percent. As mentioned above, banks view a manufactured home as a different category when compared to a traditional home. Because of this, it can be very hard to get financing, and if you can, the interest rates can be six to eight times higher than a conventional loan. Purchasing land will be required to deliver your new manufactured home when compared to a traditional home, developers will include the land in the home’s price. Some cities will have strict zoning requirements or restrictions and may forbid manufactured homes. Others, if they do accept it, may have strict appearance requirements. Consider the size of your family before buying a manufactured home. You don’t want to end up with a small house if you have a big family. At the same time, buying a big house can be impractical if you don’t have a big household. Check other options. If you feel that a house built with more durable materials can provide longevity, then check it out. You may be able to save money in the long run as it has a lower chance of deteriorating. Check with at least three to five different dealers that build manufactured homes. It’s best to get a quote for each house. It also helps to look for references and tour the homes that they have worked with in the past to see what kind of work they do.